So the much anticipated CME from Oct 13th M1.7 solar flare has gone missing. It was due to arrive last night and spark great aurora shows, but as yet there is no sign of it. Either it was VERY weak, or it is very late. There are some blips on the proton graphs which could indicate a weak CME brushed past earth, but NOAA SWPC had this forecast as a Kp4 event over the course of 12 hours or more. If this CME is late, ok, it happens, but if it is non existent or missed earth entirely. I think they need to re-calibrate their instruments. We will know more later. This morning (13th Oct) sunspot 1865 produced an M1.7 solar flare and a weak CME. We have seen reports on it all day but we wanted to wait until there was more analysis on it (which there now is). 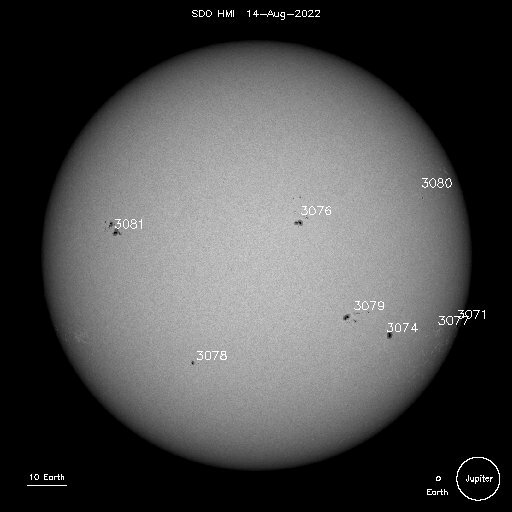 As it was an earth facing sunspot, it will be pretty much be a direct hit, or quite close to one anyway. So even though it was only a modest flare and weak CME it is highly possible to cause geomagnetic storming. Now there is more good news. Shortly before the flare and CME are due to arrive (15th/16th more exact time will follow on the forecast page), A CH HSS will also have become geoffective. The 3 things hitting earth (the green dot) in that image are in this order First the CH HSS, then the flare, then the CME cloud. Early predictions suggest G1 storm (Kp5) on the 15th. When these 3 events are due to arrive, they will be staggered, maybe a couple hours between them, so it is going to be a long night. So have your coffee ready. Remember the last CME that arrived 8th October was meant to be weak also and that reached Kp6. This CME does look pretty faint though, so it is the flare that will arrive before it that looks like it will deliver the most activity. With all three elements combined who knows what will happen. There is no accurate prediction for that. Are we in the middle of a 2 CME event? It is not clear if the current geomagnetic activity is from an scheduled CME (which arrived very early) or from an unknown CME, which means the scheduled CME is still due to arrive. CME effects are expected to persist during Oct 9 then gradually subside. Analysis is inconclusive as to whether the current effects are from the CME associated with the Oct 6 filament eruption or a different, undetected CME. If they are separate events, then the CME from the filament eruption on Oct 6 is expected to arrive late on Oct 9. Solar wind conditions are expected to be influenced beginning on Oct 11 due to the onset of a coronal hole high-speed stream (CH HSS). Nominal solar wind conditions are expected until late on Oct. 9, but then an increase in wind speed, IMF Bt, and IMF Bz variability are expected late on Oct. 9 due to the arrival of the CME from yesterday’s filament eruption. CME effects are expected to persist during the first half of Oct. 10, then gradually subside. A CME is expected to brush past earth sometime on the 6th or 7th October. It is unsure if it will miss us entirely or if we get a little boost in geomagnetic activity from it. Either way, it will be quite minimal activity, but you can never be 100% with space weather. Keep an eye on the hourly forecast and real time solar wind tools, if it arrives, it will show up there.